Adopted as part of Mayor de Blasio’s Vision Zero initiative, the Right of Way Law made it an unclassified misdemeanor for New York City drivers to strike pedestrians or cyclists who have the right of way. MD Hossain was the first person charged under the law, also known as code Section 19-190. Hossain hit Gallo as he turned left into a crosswalk at Madison Avenue and E. 79th Street on August 29, 2014. Gallo was stuck beneath the cab until witnesses overturned the vehicle to extricate her. She was pronounced dead at Lenox Hill Hospital. DNAinfo reported that Gallo, a 58-year-old Pilates instructor, was scheduled to leave for Ireland the day after her death, to work and live with her boyfriend. 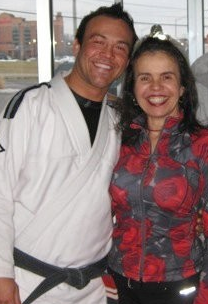 Gallo’s son is former mixed martial arts star Jorge Gurgel. Hossain was charged with violating the victim’s right of way and careless driving. He filed a lawsuit claiming that Section 19-190 violates the state and U.S. constitutions by “undermin[ing] the very concept of innocent until proven guilty” and “purport[ing] to regulate alleged reckless driving ‘by imposing criminal penalties on a strict liability’ basis.” Hossain also challenged the application of the law in his case. In November 2015, New York County Criminal Court Judge Ann E. Scherzer dismissed the suit, rejecting Hossain’s claim that the law presumes driver guilt. Hossain was fined $750 plus $200 in court fees, according to court records. His drivers license was suspended for six months. Under Cooper’s Law, the Taxi and Limousine Commission is required to revoke the TLC licenses of drivers who are convicted of a traffic violation or crime for causing death or serious injury. As of last spring, however, the agency had never used the law to permanently revoke a TLC license. We’ve asked the TLC if Hossain will be eligible to operate a cab after his drivers license is reinstated. We’ll update this post if we get an answer. We suspended him pursuant to Cooper’s Law. His TLC license was suspended at the time he would have been up for renewal, so it automatically lapsed and is listed in our database as “failed to renew,” so revocation wasn’t necessary here. If he reapplies, his record would be reviewed and his application will be denied as a result of the criminal conviction resulting from the plea, so essentially there’s no difference in the result — he will not be able to drive for-hire.